User name recovery. To update the label so the user know that he can logging with email or user name. Document Purpose: This document describes the requirements, issues, and proposed resolution for a requested change to bccf.ca and related systems and processes. Background: Currently, users have a username and an email. Users can use either to login to the site. Users are contacting us saying they can’t remember their username and they don’t realize that they can login with their email as well. High-Level Business Requirements Goal: The system should be easy to use. Current State Several major categories. Problems and Issues with Current State Users aren’t aware that they can login with their email address as well. 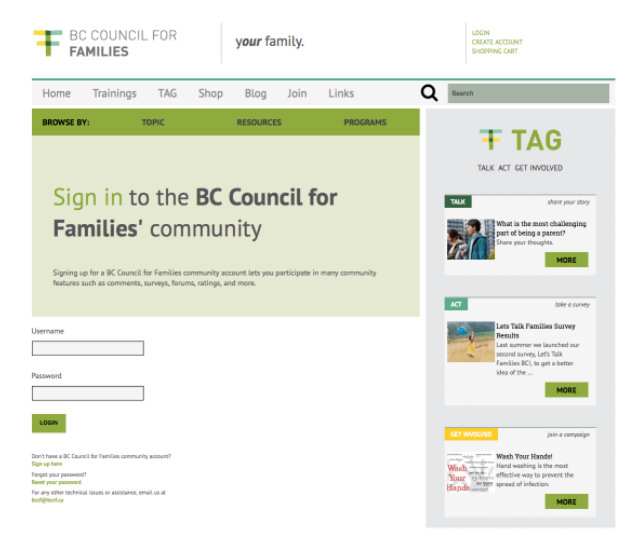 For most users, BCCF.ca is not important enough for them to create and remember a separate username. The additional username does not provide significant security protection. Target State Issue combined with BR-2 since both impact layout and usability for the same pages. Solution Approach Changes https://www.bccf.ca/accounts/signup/ Change “Username” to “Username or email address” https://www.bccf.ca/accounts/update/account/ Preferably hide. If too difficult, change “Username” to “Username or email address”. https://www.bccf.ca/accounts/login/ Change “Username” to “Username or email address” Implementation Regression testing not required. Test impacted Use Cases. Action Items Confirm whether data migration is required. Confirm whether username is encrypted/salted in database. Developer to implement change. Issue #38 was marked as a duplicate of this issue. Issue no longer relevant because after shop implementation, users can't use email address to login. They can only use username as the label indicates. Username recovery is a new feature that would need to be built to support forgotten username. The usernames are not encrypted (nor salted). Password reset email now contains the username reminder.